Combine mince, spices, ginger and onion in a bowl. Season. Shape into 12 x 6cm logs. Spray with oil. Heat a char-grill plate over moderate heat. Cook and turn kofta for 8 minutes or until browned and cooked. 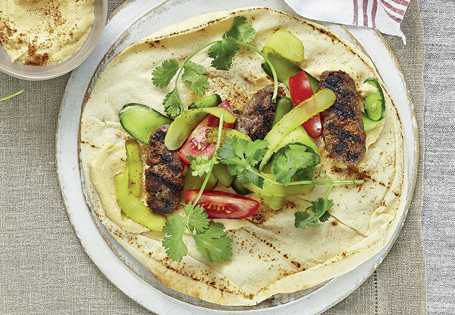 Spread flatbread with hummus; top with cucumber, kofta, tomato, gherkin and coriander. Top with extra cinnamon. Wrap to serve.